The first time I sat down to write a journal entry, it took me 45 minutes to put anything on paper. Two sentences in, I decided what I was writing was utter crap, scribbled out my words and dramatically ripped out, crumpled up and tossed the piece of paper. The worst thing in the world, after all, would be to start out my journal with less-than-perfect thoughts. Four cliche-papers-squished-into-balls-and-thrown-in-a-wire-mesh-trash-can later, I started over yet again, not because I didn’t like my words but because my penmanship was sloppy. This all may sound over-the-top to you (because it kind of is), but I’ve heard others, particularly writers or people with perfectionist tendencies, describe similar struggles when trying journaling. Non-writers tend to have a slightly different problem: They don’t consider themselves good at writing, so why bother writing when it’s just going to be nonsense? Here’s what I’ve come to learn: It was impossible for me to keep a “successful” journal until I was finally ready to give up on the idea that journals have to be successful. Every word I put down didn’t have to be beautiful, every sentence didn’t have to be beautifully strung together and every entry didn’t have to have some profound point. More importantly, I needed to start writing for me and not for the me I envision myself as or for fictitious readers. My entries can be disconnected and all-over-the-place and sloppy. They can have typos and Dr. Suess-like words. Some days they can be mini pity parties or venting sessions. Some days they can just be about what I did (even if what I did was seemingly ordinary and mundane). Basically, once I cut myself some slack, I was able to journal almost every day. Some days I’d write for only a few minutes. Other days I’d find myself three pages deep in thought. Both scientific and anecdotal research suggests there can be healing power in journaling. “I think the process of writing itself can be therapeutic no matter really what the content is that you are writing about… You don’t have to be writing about your day, you don’t have to be deeply reflecting on a specific issue in order for the process itself to be therapeutic,” Annie Wright, MFT, a licensed marriage and family therapist practicing in the San Francisco Bay area, told The Mighty last December. Journaling became particularly useful for me last year, when I underwent three sinus surgeries, the last leaving me mostly immobile for a month. While my chronic headaches are less intense than they used to be, I now deal with damage to my trigeminal nerve, potentially from the surgeries themselves or from the severity of my initial sinus infection. As someone who’s been fortunate enough to be healthy for most of my life, this experience left me with a lot of new feelings to unpack, mostly negative ones as I adjusted to a new normal. It also exasperated my anxiety attacks, which for me, present as heart-attack-like chest pains. “Messy” journaling — forcing myself to write down my train of thought, emotions, day-to-day activities without editing my words or giving up when I feel like I’m not really saying anything — has been one of the only ways I’ve significantly found relief from both my physical and mental pain. If you are looking to reap these benefits all you have to do is journal. It’s not a matter of having perfect use of grammar or verbal [timing]. It doesn’t necessarily have to make sense. It’s your story, and as long as you are feeling it, it’s valid. Any type of manifestation is welcome (art, music, dance, poetry), and it doesn’t necessarily have to be public. Just by getting it out is a huge step. It’s important to mention: We are by no means suggesting journaling will “cure” someone’s condition (if that’s even your goal). We’re also not suggesting journaling is only beneficial if you’re going through a health challenge. 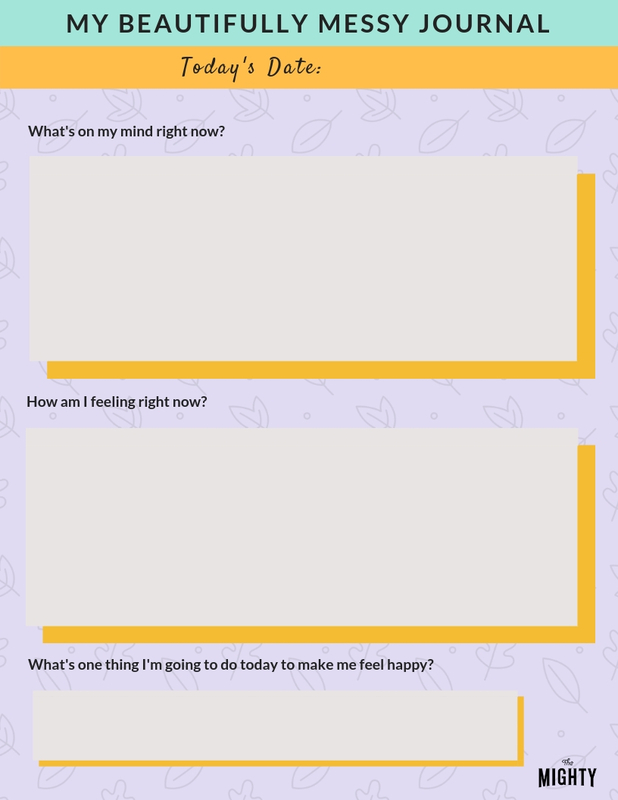 Instead, this journaling guide is meant to give you a healthier way to navigate the complex emotions that life likes to throw at us each day. While a journal may feel like the perfect place to lament, this journal may be a place you come to relive the wonderful moments that happened to you, too. Even if you’re the farthest one can be from calling themselves a writer or if you’re like me and the fact that you identify yourself as a writer is keeping you from leaning into journaling, this self-care challenge may be for you. We also have a drawing option (see below) if art is the best way for you to express yourself. If you are unable to write or type, consider using a recording device on your phone or computer, and speaking your thoughts (don’t worry, you don’t have to play them back if you don’t want to). At the end of your morning session, write one thing you are going to do that day to help you feel happier. This can range from big things like attending a concert or reaching out to an old friend to little things like singing out loud in the car to a song no one else seems to love as much as you do or spending time with your pet. At the end of your evening session, write down one thing you’re grateful for. Again, this can be big and small. One day, you may be grateful you have an amazing support system. Another day, you may only be grateful there was enough sugar left over to make your coffee taste just right. There are no wrong answers. This may feel like a challenging task if you are someone who deals with a debilitating condition, life-threatening illness, depression, etc. In the depths of my own pain, there were days I was tempted to say I wasn’t grateful for anything. But ultimately that way of thinking did me no good. I’ve found there are ways to acknowledge you have it tough while also appreciating the beauty in your life. If writing is truly not your thing, every morning and evening, draw what you’re feeling. Then, answer the same questions. Some days this may look like scribble. Other days you may feel inclined to use every crayon you have. The drawings don’t have to make sense to anyone but you (actually, they don’t even have to make complete sense to you). Similar to the writing challenge, don’t question what your brain wants to draw — just get it out. This journal is entirely for you — but if you’d like to connect with other Mighties taking the challenge this month, follow the hashtags #MyMightyMonth and #MessyJournaling. You can discuss how it’s going for you here and if you’re finding it helpful or challenging. You’re also welcome to share your daily goals and the things you’re grateful for (but only if you want to). Want to make November a Mighty Month? You can follow our My Mighty Month hashtag here, and don’t forget to tag your posts on The Mighty with #MyMightyMonth and #MessyJournaling. You can also sign up for our My Mighty Month emails, (select “Mighty Monthly Challenges” from the newsletter options), which include tips and reminders designed to keep you motivated.